Most popular keyboard throne with easy use and light travel for aspiring musicians. Features a reinforced steel structure that's easy to set up and take down. Secure locking of leg position with angled detent locators. Foam padding is covered by tough, tear-resistant vinyl keeping you comfortable and focused throughout the performance. 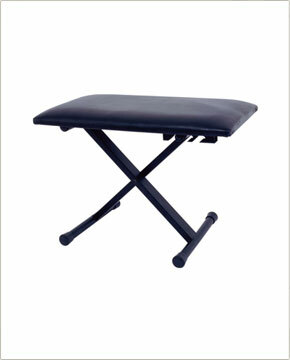 Non-slip rubber cushions ensure the bench stays where you put it.